Protect Your Oak Trees from Deadly Disease: Prune in Winter! Oak wilt, a deadly fungal disease for oak trees was discovered in six new locations in New York last year. This disease can be spread by beetles that are attracted to freshly cut or injured trees. 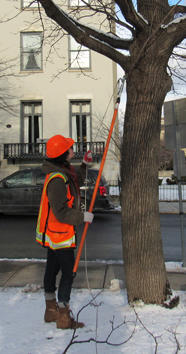 Pruning in winter protects oaks from becoming infected. Diseases are rarely spread during this time, since insects and fungi are inactive. A tree's branch pattern and damaged limbs are easier to see without leaves. How does oak wilt spread and kill trees? The oak wilt fungus clogs the trees’ transport vessels, cutting off water and food from leaves and the rest of the tree. One way oak wilt spreads is when fungal spores hitch rides on insects. Sap beetles, one of the main culprits, are extremely attracted to fresh tree wounds. Pruning oaks during the growing season greatly increases the chances of insects infecting them with oak wilt. What else can I do to protect my oak trees? For questions, contact the DEC Forest Health office at 1-866-640-0652, or email photos of tree symptoms to: foresthealth@dec.ny.gov.